Scratchbord is a clay coated hardboard panel that is coated with India ink. Comparable to traditional paper scratchboard, except better – it’s more durable and easier to scratch into for cleaner and crisper details and lines. For added dimension, coloured inks can be added to the white areas and then scratched again for additional highlights and volume. Ampersand Scratchbord is No.1 with the worlds professional Scratchbord artists. It is Museum quality, acid free, archival. It can be sealed and framed without glass. Ampersand make a range of tools for use with their scratchbord. There are also a range of 6 colours of Scratchbord/Claybord inks so you can add colour. Detials of the inks and tools are cotained below with the rest of the Scratchbord range. 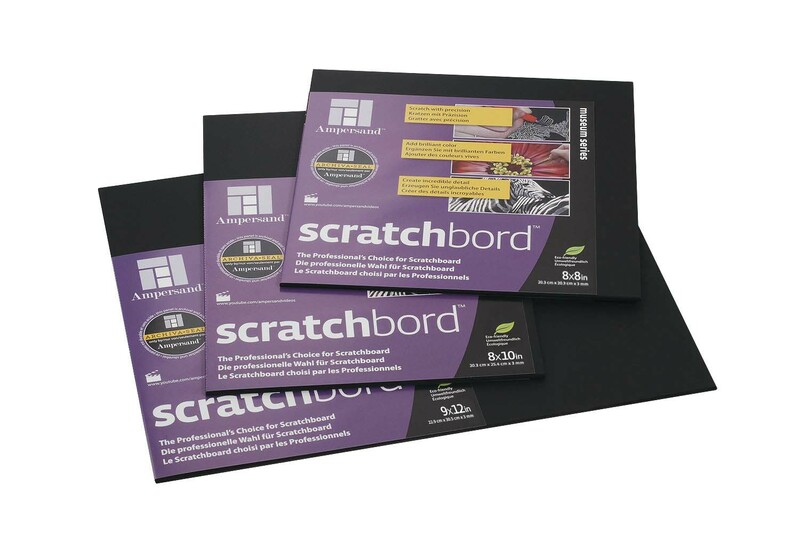 £10.12 Scratchbord 11x14 - 1/8"
£14.88 Scratchbord 14x18 - 1/8"
£17.46 Scratchbord 16x20 - 1/8"
£3.04 Scratchbord 5x7 - 1/8"
£6.75 Scratchbord 8x10 - 1/8"
£5.83 Scratchbord 8x8 - 1/8"
£8.00 Scratchbord 9x12 - 1/8"